$565.00 Price for the pair as a set. 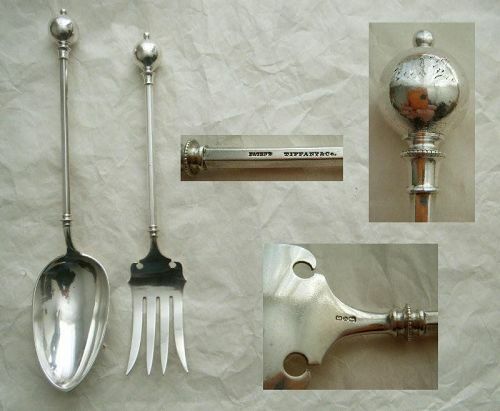 This salad serving fork and spoon have a double provenance that bespeaks the finest of mid 19th century silver manufacturing and retailing. Made by George Sharp of Philadelphia, they are stamped with his "lion, S, lion" emblem, as well as "Tiffany & Co.," who would have retailed this pair about the mid 1860s. Presumably they are sterling rather than coin silver, given that Tiffany early on required this. They are exceptionally large items, with the fork measuring 10 3/4" long and weighing 4.1 T. oz., and the spoon 11 3/4" long and weighing 4.6 T. oz. The design is "Ball End," for which Sharp is known. They have hexagonal stem handles bordered on top and bottom by a beaded grommet like detail. The fork has scalloped and hooked shoulders and slightly splayed outer tines. The bowl on the spoon is particularly large at 4" long and 2 3/4" at the widest. Each piece has a somewhat polished down Old English "M.I.L." monogram on the ball. The pair are in very good condition. There is overall light surface wear consistent with age, and one pinprick dimple on an otherwise well-shaped, dent and burr free spoon bowl.